Information technology today is a critical function in the enterprise. IT is not only a supporting function, helping to automate routine tasks and promoting process efficiency: It has also become integrated into the products and services of many industries. Even organizations that do not consider themselves “high-tech” are increasingly leveraging IT for digital transformation and as a core element of their emerging business models. Yet, in many companies, business leaders only manage IT as a technical function. The IT systems, IT organization, and IT processes may be designed well from a technical perspective but poorly aligned from a business perspective. This can be the result of changes in business direction, sudden or long-term growth, acquisitions, or competitive disruption that create dissonance between what the business needs and what IT is providing. Business and IT Alignment. We begin with a review of the mission, vision, goals, and strategy of the business, so that we can derive the implications for IT–what IT needs to be and do in order to support the business strategy and deliver business value. Conversely, what capabilities can IT implement that can form the basis for new business models? IT Current State Analysis. Here we conduct an assessment of the current IT environment, including the organization’s data centers, networks, equipment, documentation, and use of cloud computing. We also assess the health of the current IT applications portfolio, with a combination of online user surveys and in-person interviews, ranking each major business system in terms of its importance to the organization, its actual management value, and its technical quality. This gives us an early indication concerning which systems are the highest priority candidates for nurturing, replacement, or upgrading. Using metrics provided by our sister IT research firm, Computer Economics, we also benchmark IT spending and staffing levels, the use of outsourcing and outside IT service providers, and the state of IT management best practices. We also look at what new IT initiatives are already planned for the future. IT Future State Vision. This is the visioning stage of IT strategy, envisioning a future state where IT systems, technology, people, and processes are fully aligned with the business strategy. This stage can also include “art of the possible” workshops, where our IT strategy consultants explore what new and innovative technologies have most relevance to your business, and which you should consider for adoption. After painting this picture, we then compare it to the current state and conduct a gap analysis. 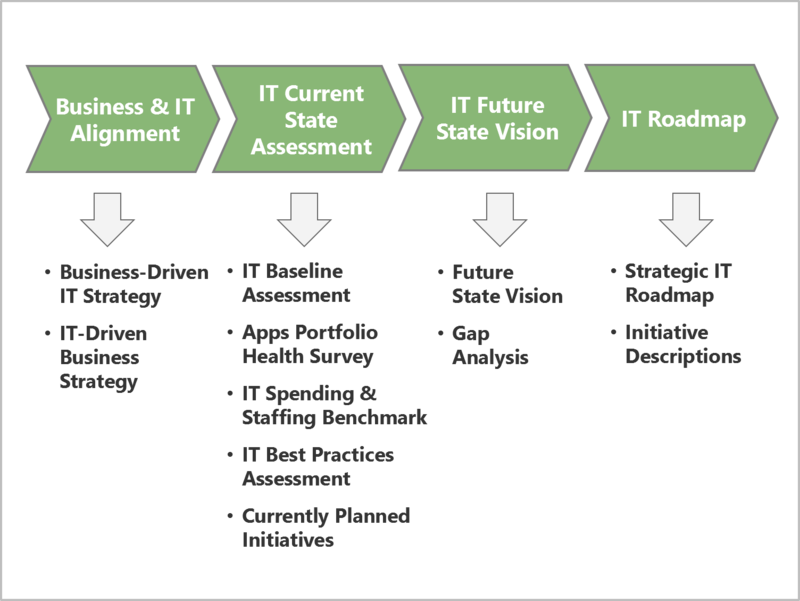 IT Strategy Roadmap. This is the formulation stage, where we define the individual initiatives of the IT roadmap and weave them into a strategic narrative: a story of where you are going and how you’ll get there. The final deliverable is a strategic IT road map for the enterprise that defines the desired future state, the major initiatives, and the priorities for implementation. It also includes summary descriptions and budgetary estimates for each of the major initiatives of the IT roadmap. Strategic initiatives can include new business application systems and IT capabilities, upgrades, IT infrastructure improvements, IT organizational changes or restructuring, IT process improvements, IT governance structures, and risk management programs. IT Applications Portfolio: the business applications that the organization will utilize in support of business processes. These commonly include ERP, CRM, HR/HCM, business intelligence/analytics, and a wide variety of industry-specific systems. IT Infrastructure: The technical architecture of hardware, operating systems, databases, end-user computing platforms, communications, and facilities. This also includes use of newer cloud platforms to replace on-premises IT infrastructure and systems. IT Service Management: decisions concerning how and where IT services should be delivered and by whom, whether by internal IT work groups or by outsourcing or managed services providers. IT Organizational Design: IT is not just a matter of technology–it is also about people. Our IT strategic planning services also include evaluation of current skills and staffing levels, identification of skills gaps, and designing the optimal IT organizational structure to carry out the road map. If needed, we can also assist in the recruiting process for new IT personnel. IT Management Best Practices: IT has its own internal processes, which should utilize proven best practices. These include best practices for IT governance, IT financial management, IT operations, IT security and risk management, applications development, and innovation.